Ryanair is one of the great success stories in the aviation industry, so why does it divide opinion so much, asks Vivian White, and why do people who don't like it still use it? Like Marmite, Ryanair is the airline people either love or hate. The very mention of the name of its high-profile and strident chief executive Michael O'Leary, who is the human embodiment of the airline, provokes strong reactions among travellers at Dublin airport. "Obnoxious - that's the one word I think of when I think of that man," says one smartly-dressed young woman who gets straight to the point. "Michael O'Leary's a mighty man!" a cheery looking gentleman says, while another lady says Mr O'Leary "should be running the country". She seems buoyed at the very thought of it. Ryanair is now one of the biggest airlines in Europe, which signals that it is doing something right - a point stressed in a steady flow of e-mails from consumers to the BBC. The no-frills carrier definitely has its friends as well as its foes. Tom Ward e-mailed to say he is trying to visit a different European country every month of the year. "There's no way I'd be able to afford to go and see all the places I have without the special offers that Ryanair have had on," he says, boldly declaring: "I love Ryanair". He's not alone. Meet the ultimate Ryanair customer. He is plane-mad, luggage-light and crouched over the computer ready to pounce on the latest "damn-near free" offer that Mr O'Leary has on tap. But there are plenty of opposing views as well. Antony Byrne of London currently resides firmly in the "hate 'em" camp. Mr Byrne had a very bad air day at Stansted airport in August when Ryanair did not have enough bag-drop desks to deal with the number of passengers who had been hoping to go on holidays that day. Ryanair had eliminated dedicated bag-drop desks for separate flights and Mr Byrne and his family were among more than 700 passengers who did not make their flight. "By eliminating costs they are also eliminating certain services that customers demand," says Mr Byrne. In his case, the service that Mr Byrne did not get ended up being his actual flight. Ryanair recognised that something went very wrong on that day, apologised to the passengers who were grounded and Mr Byrne was reimbursed. At every point along your Ryanair journey there is a little extra saving to be made, or extra revenue to be gained, a point reinforced from the minute you click on its website. First there is the online booking fee of £5, per flight per person, unless there is a promotional offer. You must print out your own boarding pass and bring it along, otherwise printing it at the airport will cost you £40. Again, that is per person, per flight. The airline says there are no "hidden charges", stressing that all of these fees are spelled out on the website. But could these fees somehow risk the company's reputation? Gary Davies, professor of corporate reputation at Manchester Business School, says Ryanair has a strong brand - there is a high level of awareness and it has significant associations like low cost and Irishness. His research three years ago suggested that Ryanair, like Microsoft and News International, was a company that people in Ireland viewed as "ruthless" but not to the extent that they would stop using it. But since then, Mr Davies detects a slight erosion of that position, as more people perceive the airline to be "cheating" with some of its charges. "More recently, the complaints we hear about are to do with the psychological contract between customer and company. It's not something on paper but it's there in your mind, an expectation of fair dealing. "Quite often, Ryanair seems to be doing things that people think are unfair, then the media picks it up and it becomes a story." If that contract is broken, says Mr Davies, then Ryanair is in trouble, because if people lose belief in its competence then they may hesitate before buying. "There's a tipping point and I would expect Ryanair to be sensitive to this and avoid it, because it's a precipice. Once you go over it, it's terribly difficult to climb back." Ryanair can avert that happening, he says, by being a little more flexible on charges. But going upmarket would be their death knell, because cheap is what Ryanair is all about. "That's what an advertising man would describe as brand essence, that's the heart of the organisation." Mr O'Leary doesn't set out to be disliked, he says, but his priority is to be loved by shareholders. 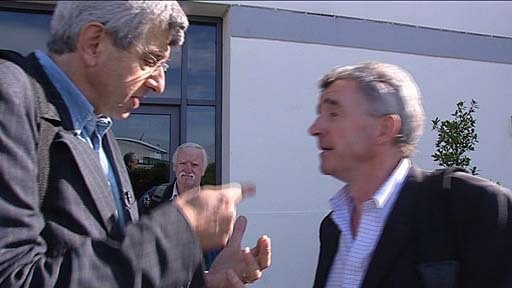 Talking to the BBC in a car park in Dublin, Mr O'Leary says: "We guarantee the lowest air fares in Europe, we're the only airline to guarantee no fuel surcharges no matter what the price of oil and we do that because we are tough with suppliers." Ryanair is Britain's favourite airline and will carry 67 million passengers in the coming year, he says. It is indeed the darling of the industry, the European success story of the last 15 years, says aviation analyst Tim Coombs. It is not in the business of being loved. "I don't think they go out of their way to make enemies, they just go out of their way to be the most efficient carrier they possibly can be." People who book a Ryanair flight do so because of the price, he says, which they often believe to be the cheapest on offer. On board, there is no recline button on the seats and a sandwich costs £4.50, a cup of coffee £2.70. Another competitive advantage is its speedy turnaround. Ryanair rejects airbridges - those extending jetties that connect the terminal to the plane door - in favour of a set of stairs. In 25 minutes, a Ryanair plane can land, disgorge its passengers and be ready to take off again. The cabin crew work partly on commission, and about half of their staff work for an employment agency rather than the airline directly. One Ryanair captain said that while he had been given a good career opportunity at a young age, when asked to describe Mr O'Leary, he responded "bully". love 'em or hate 'em. I cannot understand the media's obsession with Ryanair, no one is forced to fly with them. There are plenty of alternative (and more expensive airlines) to choose from. It does exactly what it says on the tin, it is a low fares airline. Mr White missed a few of the airline's more insidious tricks, which those of us who use it frequently know about, such as its new bag weigh-ins at the boarding gate, after they've bought duty free (which in many cases will have taken them over the 10kg baggage allowance). Ryanair introduced this last-minute shake-down this summer, weighing bags before boarding and forcing people to pay £40 penalty to check their bags into the hold if duty free had taken them over the allowance. And in the event of double bookings, they wait until an hour or two before check-in for the flight closes to send an e-mail alerting the customer to that fact - by which time it is too late to do anything about it or claim a refund. I have reported Ryanair to Trading Standards for this and was told that it is illegal as they have a duty to provide services with due care and attention. Recent charges and developments have made me reluctantly stop using the airline. Why? Flying in frequently from the US I used to make further connections using Ryanair. The new uncertainty (e.g. printing Boarding Pass at airport) and the associated extra costs have made me make alternative arrangements. While I admire Michael O'Leary and detest (some of) his attitude equally, the thing that re-assures me about Ryanair is O'Leary's admission that the only thing that keeps him awake at night is safety. It has also been stated that it is the only area where he refuses to cut costs. I hope this is true. Well I'm definitely in the 'I hate Ryanair' camp. And the idea that they're cheap just doesn't add up. If like me you book a business flight with maybe 3 days notice then they're often one of the more expensive by the time you add all their hidden charges. Given the choice I'd rather fly say British Airways, and pay the extra £20 or so and have a nice comfortable flight with a coffee and a seat I can actually fit in (I'm 6'4") rather than the 'Sit down and SHUT UP' attitude I often suffered with Ryanair. I used to prefer Ryanair to Easyjet but now they charge you for every little thing I've given up on them, its all very well for single people who can fit 2 weeks worth of clothes into a small bag but for someone with a toddler the fees rack up mighty quick until British airways becomes the cheaper option! 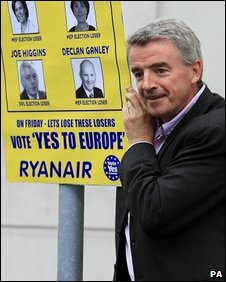 I totally agree with O'Leary, the media is campaigning against him and Ryanair unfairly. I have flown with Ryanair for the last five years regularly, at least four-six flights a year and never had any problems. No lost baggage, no "hidden" costs, no nothing. And always well below £30 return flights. The hidden costs only appear to people who can't actually read. I work as a receptionist and I know how some people complain about things as "hidden" and "never mentioned" that were clearly stated in the booking. If one reads every word through booking, then he or she will find out about every charge, and if someone packs for a two-week holiday clothes that would be enough for a year-long trip, then they should be prepared to pay extra. I personally only fly with hand luggage so I won't need to queue to check in or pay extra for anything. So if you wanna fly cheap, be prepared to make sacrifices. 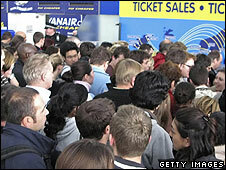 Flown with Ryanair many times and always felt like cattle, and unwanted cattle at that. This September my family and I happened to fly internally in Italy on another cheap airline. We got: numbered seats, free coffee, free biscuits and preferential treatment because we are a young family. No pushing and crowding to get on the bus, no rude people attempting to get in front of you, all generally very pleasant. The time of the flight was also more convenient; we left Milan Linate at midday. The equivalent Ryanair flight would have meant getting up at four in the morning. Suffice to say, we will not be hurrying to fly with Mr O'Leary's company in the near future. We have had a number of very positive experiences with Ryanair. As we have four young children, air travel is never easy. We have used Ryanair a handful of times. The prices have been fabulous (even with extras) and the staff have all been pleasant and helpful.